Home NEWS WILL THEY STAND ASIDE WHILE ANOTHER PLAYER IS BLACKBALLED BY THE NFL? Safety Eric Reid, who in 2016 was the first American football player to join former San Francisco 49ers quarterback Colin Kaepernick in protesting racial inequality and systemic oppression by kneeling during the QUS national anthem, confirmed last week that he has received no offers from any NFL teams in the first few days of free agency. By now, several players who are free agents have either re-signed with their old teams, signed with new teams, or have been taking visits from potential teams. However, Reid’s phone and that of his agent seemingly are in the midst of a nuclear winter. Reid, who was selected to the pro bowl and the NFL All-Rookie team in 2013, expressed his belief on Thursday that NFL team owners – and not their general managers (GM) – are the core reason why he has not been able to sign a new deal. “GMs aren’t the hold up [brother]. It’s ownership. People who know football know who can play. People who know me, know my character,” Reid remarked via Twitter last Thursday. Reid, 26, is a versatile player and in 2017 he played not only at the safety position but also at free safety, strong safety and obviously out of position at the linebacker position. Whatever the team needed after several players went down with injuries or were cut, Reid was ready to provide in stellar fashion. Playing in 13 of the 16 regular season games for the 49ers in 2017, Reid led the team with two interceptions and had the third-most tackles at 66, with 52 of them unassisted. In the five years since he has been with the 49ers, Reid ranks 11th among safeties in the league in the number of yards that interceptions were returned for, 20th in passes defended and 27th in unassisted tackles, though, playing in only 70 of the possible 80 games. Interestingly, it seems his versatility and productivity on defence has not been the driving force in teams trying to acquire him in free agency. 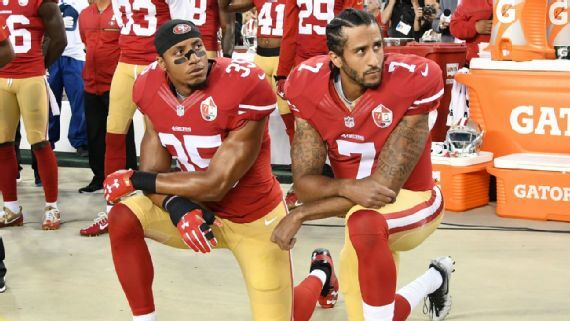 However, it seems Reid, like Kaepernick last season, is about to be blackballed by NFL teams for his stance in 2016 against social injustices when he knelt during the US national anthem. Interestingly, so far, the owners in the NFL have taken football away from Kaepernick, who was ranked among the top-25 quarterbacks in the league in terms of fantasy points in 2016. Kaepernick went unsigned in 2017 and the prospects of his return in 2018, though he has an amazing arm and is a threat with his legs, is slim to none. Towards the end of last year, Reid, the former Louisiana State University graduate, seemingly was mentally prepared for a similar outcome where football could be taken away from him. It was reported that before the 2017 season, Reid had come to a decision that he would return to standing during the anthem. However, after the supercharged racial tempestuousness in Charlottesville, Virginia, in August last year, he had a change of heart. A few weeks after that racial unrest, US President Donald Trump, at a rally in Huntsville, Alabama, declared that NFL owners should fire athletes who engage in peaceful protests of kneeling or sitting during the national anthem. He referred to those athletes as the male offspring of female dogs and remarked that their protests were disrespectful to the American flag. In addition, he suggested that fans should walk out of NFL stadiums whenever the players protested. Seeing the financial impact that Trump’s suggestions would have on the league and their teams, all the NFL owners and the commissioner joined the players in kneeling, sitting or holding hands during the national anthem to protest against Trump’s comments. Interestingly, it appears that the ostensibly hypocritical owners are once again in unison in keeping Kaepernick and now Reid, the progenitors of kneeling during the national anthem in protest, out of the league. In 2017, as the protest by kneeling continued several weeks later after President Trump’s comments, a coalition of players met with NFL owners and league representatives to determine the way forward. Kaepernick was not invited initially to those meetings and after receiving an invitation later, he declined. Reid, who joined the coalition of players, later left after feeling that its leader, Eagles safety Malcolm Jenkins had misled him about the objectives of the coalition. Thereafter, the player’s coalition, the NFL owners and league representatives agreed that the league would donate $89 million over seven years to projects focused on criminal justice reform, law enforcement and community relations and education. If Reid goes unsigned this season, and Kaepernick’s exile from the league by the owners continue, then the NFL ownership and by proxy the commissioner cannot deny the underhanded tactics of ending players’ careers who stood up for their rights and that of others. The silence of the star players in the league on these matters of blackballing players and the social injustices in the American community is earsplitting. They have chosen to sit in convenience than to take a controversial stance.